The AngleBuddy's industrial grade aluminum alloy will never break in your toolbox (unlike cheap plastic knockoffs). Not only is it easy to use, it's even easier to master! Loosen the easy-grip metal knobs, place the tool on an object, adjust the template ruler to desired angle or shape, and tighten the knobs. Once that's done simply transfer the template to your desired material, trace the angle or shape that you want to create, make the cut and you're done! Copy perfect shapes onto brick, tile, wood, glass, stone, laminate, paving, lumber and more! Use it to create plumb cuts, arches, joists, bull's eyes, etc. The AngleBuddy can even be used as a carpentry square and t square. Even make perfect circles! Our easy to use layout copy tool will blow away any woodworking expert, architect, crafts men, etc. "Easy to use and will come in handy when installing flooring." - Oscar C.
AWESOME FREE BONUSES - Clip-on bubble level ($3 value), premium carrying case ($3 value), and 6-in-1 multi tool ($10 value). 6-IN-1 MULTI TOOL - Comes with a ball point pen and stylus, a spirit level, a ruler, and a flat-head and Phillips screwdriver concealed inside. LIFETIME GUARANTEE - Our iron-clad guarantee takes away any risk. If you aren't happy, let us know why and we'll refund your purchase! ✔ HEAVY-DUTY UPGRADED ALUMINUM - Our angleizer template tool is constructed with industrial grade aluminum for durability and precision. It's foldable, portable, and sturdy, so you can use it time and time again! 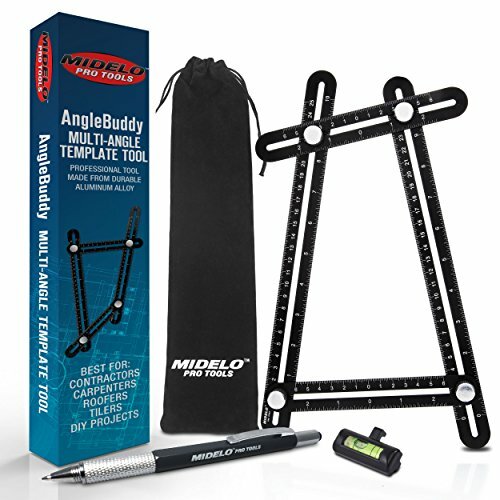 ✔ EASY TO USE - Adjustable and multifunctional, the AngleBuddy multiangle template tool works great on brick, tile, wood, glass, stone, laminate, construction & engineering projects and more! Simply adjust the 4 metal knobs to create your desired shape accurately. ✔ 3 FREE BONUSES - The clip-on bubble level, 6-in-1 multi-tool, and the premium carrying pouch are the perfect accessories for getting the job done. ✔ PERFECT GIFTS - These tools make great gifts for architects, crafts men, contractors, DIY-ers, bricklayers, roofers, woodworkers, artists and much more. ✔ LIFETIME GUARANTEE - Our iron-clad lifetime guarantee takes away all the risk. If you aren't happy, let us know and we'll replace your angelizer or refund your full purchase price. If you have any questions about this product by Midelo, contact us by completing and submitting the form below. If you are looking for a specif part number, please include it with your message. Security Height Indicator Tape. Made in USA.